With E3 opening it's doors to the general public for the first time ever, what better time than to share all the knowledge I've accumulated about attending conventions through my ~4 years as a content creator. There will always be so much to do at a convention. From making new friends, to attending parties/dinners you found out about last minute and of course trying to make time for everything. Review these plans before you head into the convention for the day. Base the bulk of your day around what you are wanting to get out of your convention. When you're out for lunch or speaking with folks, ask about what you are looking for - you never know who knows who and can set you on the right path. This can also be the best way to directly approach a company and inquire. Ask for what you want, better yet - if you can convince people that there is a need in said company, for your skills. You're in! The fun column is not necessary, but as you get busier at conventions and your social circle grows, it's easier to spend the whole weekend speaking with new folks and not being able to catch up with old buds. This can be fun, but in the long term can lead to a strain in relationships. Something you can do to manage organization, is creating a small list of people who you would like to see/spend extra time with can help. - Convention, Make time for X, Y, Z for a 20 minute chat NOT about business. - Party, handful of folks, I make a mental note to catch up with about life. Too many people wait until a big party to speak with everyone. The loud music, alcohol and natural forming cliques makes meeting new folks harder. Next time you're in line for a game demo or coffee, turn around and strike up a conversation. Most of convention goers are from out of state, maybe even country! Not everyone is a content creator, but some could be artists, animators, tech gods, anything and everything. You'll miss out on a whole range of people if you only focus on those who are at the same social functions as you. Plus you never know who these people might know and what opportunities they could bring to your brand. 3. Have your pitch ready, but also remember it's not all business. It is all business and it's not. As a content creator you have this thin, easy to cross line that you have to navigate. My best advice for any content creators is to BE YOURSELF. You are always making an impression, even when you don't think you are. Our industry is small and someone at the bottom of the ringer, could very well be hiring you for a sweet deal in the future. You don't have to be fake, if there are companies you don't enjoy - simply walk away. Always have the basic understanding of what your brand/content is and who you are. Also make sure to have business cards with you at all times. Not everyone will feel comfortable looking you up on twitter right away and exchanging cards creates an easy way for you to link up with folks you met briefly. If you're looking for more information about business cards, why they're important or what you should write on one - we, at XSplit HQ have created a video for you. As your social circle grows you start to realize how small a few days is and how everything will overlap. 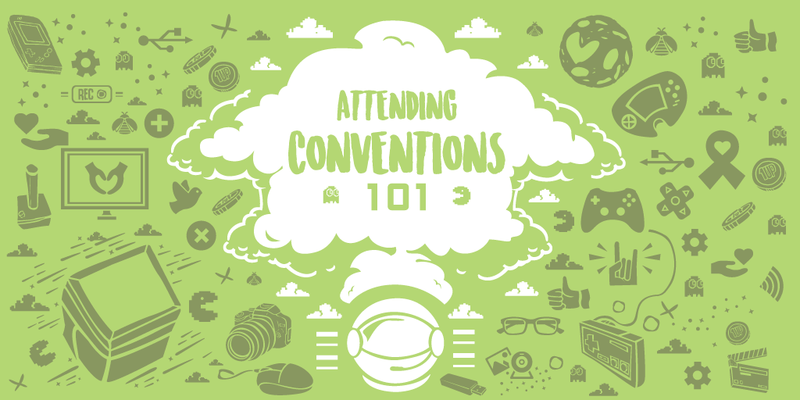 Always prioritize long social outings if you’re looking to make genuine connections.This would include lunches, dinners, and exploring the convention floor together. If it is your thing, try to go to parties! They're great! It's pretty much a huge school reunion and just like any reunion - but expect to be too busy and having too much fun for genuine heart to hearts. 5. Your health is not a joke. You'll be sleeping very little and meeting a lot of new people. Make sure to drink lots of water, eating healthy and trying to find time for sleep. Getting rest is such an important part of your convention going. You have to remember that you’re always making an impression and sometimes it would be best to have a quiet lunch by yourself or sleeping in the afternoon, instead of over exhausting yourself and being your worst self in public. It sounds trivial, but you’ll be thanking us when you’re not sick in bed for a week after the convention ends.